I am a fan of Reddit Laqueristas, a category of Reddit where amazingly talented people post pictures of their nail designs. I try to check it every day and have submitted a few pictures of my own work. Have a look the website here http://www.reddit.com/r/RedditLaqueristas/. 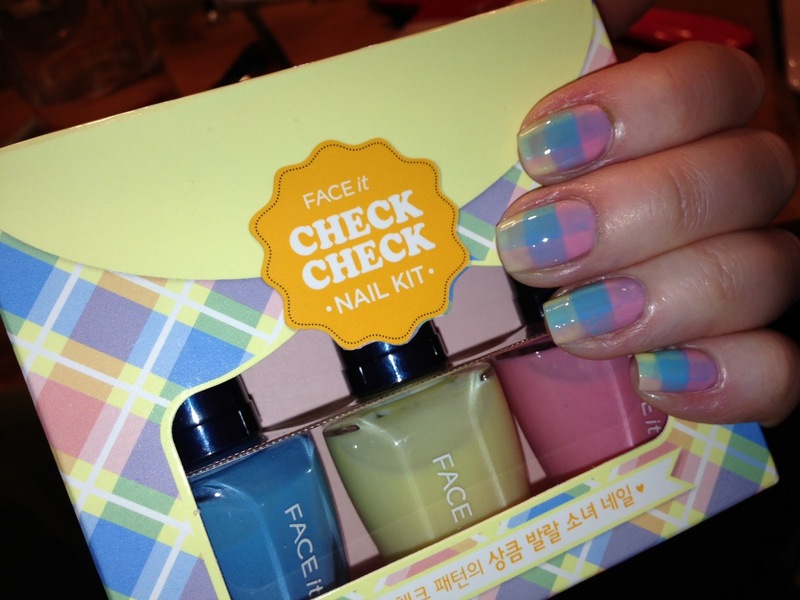 A few weeks ago, I saw a post featuring the Faceit Check Check Nail Kit. It's by a Korean brand called Faceit. I decided to look for it on ebay and see if I could give it a go. It cost $14 inc shipping. Seller is here: http://myworld.ebay.ie/saylucky7/ I must say, this seller was one of the nicest I encountered on ebay. They sent me a letter addressed to me saying they would like to visit Ireland some day and also included 4 free samples of other products. 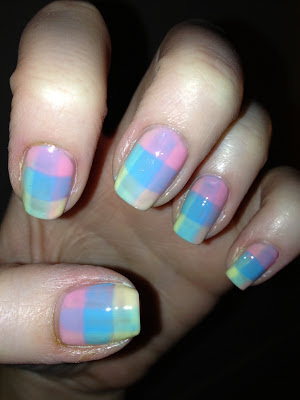 The polishes are jelly so quite sheer which facilitates making the check pattern. I did a row horizontally of each colour and then waited to dry and did a vertical row. It was pretty hard to make sure these were straight and equal in size. I finished with a coat of Seche Vite. Overall, I'm pretty happy with these as a first attempt.It was quite hard to photograph the colours, there is more definition between rows in real life. Taking photos late at night is also probably not a good idea! There is another pack with more primary colours which could be fun to try too. 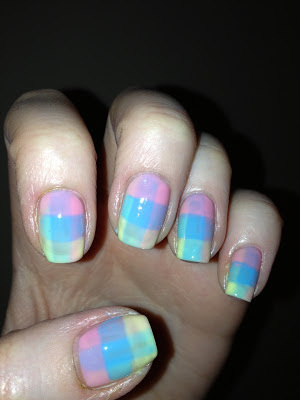 Hope you liked this nail art!